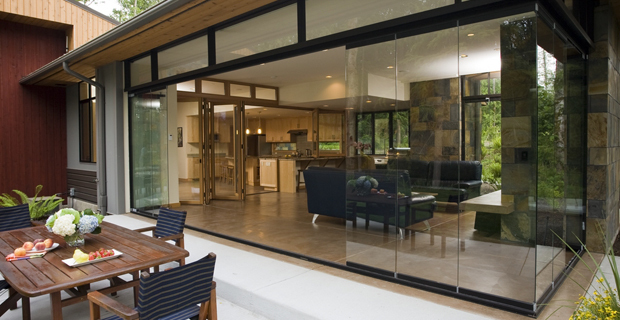 Installing a NanaWall operable glass wall in the kitchen creates instant indoor/outdoor entertainment space. The window/wall combination of the Kitchen Transition adds flexible options for the homeowner to open a countertop and/or the whole wall to the outside. Dining rooms are transformed by removing the barrier and bringing the sights, sounds, and fresh air of the landscape and surrounding environment into the dining experience. For this kitchen project the decision was to install a folding window/wall combination to give the homeowners the indoor/outdoor kitchen and entertainment area flexibility they desired. Embracing the stellar Vancouver views was one main design goal at this contemporary home. 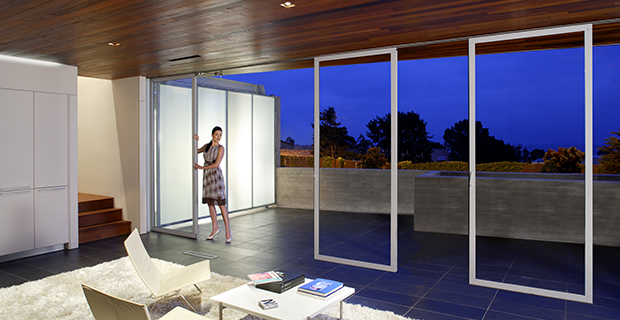 This was achieved by installing this edge-to-edge glass operable wall system — the SL82. For this hardworking kitchen of a celebrity chef, form and function was the main objective when designing the new kitchen. Now the ideal home kitchen instantly transitions to accommodate a cooking school. 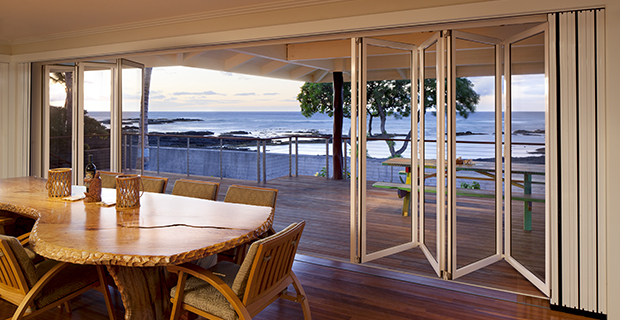 The homeowner of this Hawaiian residence wanted to open up his house to as much of the ocean views as possible. Adding the Screen Classic component offered even more flexibility for those times of year when insects may be problematic. The most unique feature of this home is the outdoor living area, completely enclosed with the frameless all glass sliding system. Come rain or shine, this cozy space doesn’t lose it functionality or usability. Providing a continuous indoor/outdoor experience, where the house opens completely to the outside without delineating a boundary, was essential in this contemporary residential project. 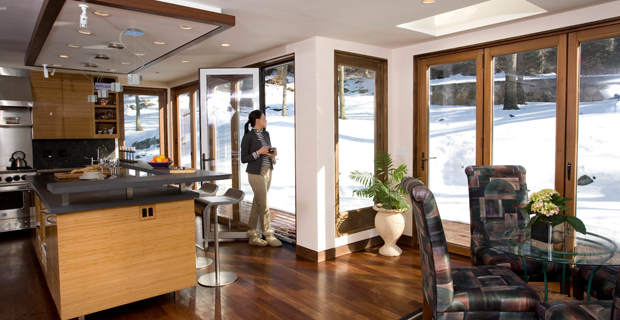 The NanaWall HSW60 Single Track Sliding system was the specified solution. 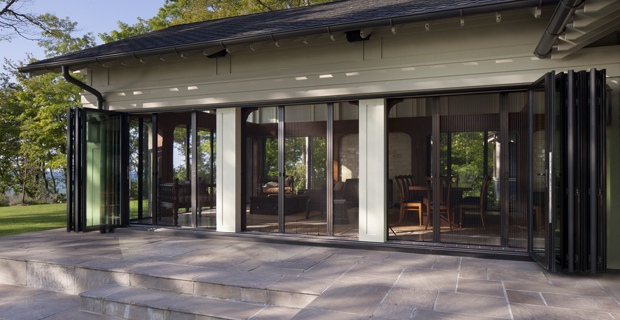 For this Lake Michigan residence, the architect specified a combination of NanaWall's SL70 Thermally Broken Aluminum Framed Folding System and Screen Classic, in order to maximize flexibility, visibility, connection to outdoors and thermal performance. These homeowners tackled an ambitious remodeling project with the goal of opening up and brightening an old 1940 Spanish Mediterranean home. Learn why they decided to make NanaWall SL60 the centerpiece of their new home and why that feature is so essential to finished product.